Saturday’s climate accord enshrines forest protection in a stand-alone article for the first time in history. Gustavo Silva-Chavez explains why this matters and what it means for our ability to use forests as a bulwark against climate change. This story initially appeared on Huffington Post. Click here to view the original. 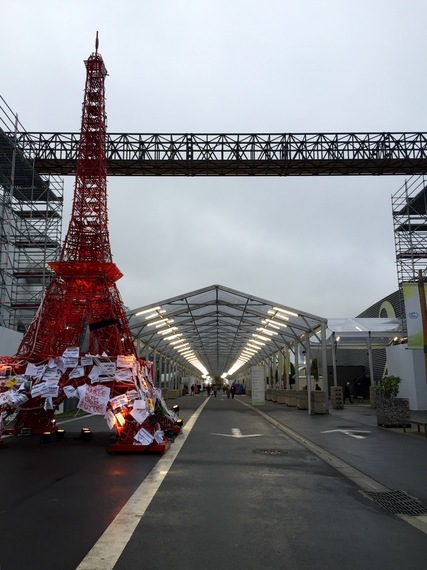 14 December 2015 | PARIS | The global climate agreement reached in Paris marks a historic moment for forests as they are now enshrined in international climate action. All countries agreed on simple but strong language that operationalizes forest protection and flips the ‘on’ switch for the international finance to make it happen. It also brings in the necessary technical and scientific rules to make sure there is the blueprint to build national forest protection plans. In doing so, they expanded the opportunities for forests to play a key part in our global response to climate change, helping to achieve both mitigation and adaptation goals. Why was it so important that forests be included prominently in the Paris Agreement? Deforestation, primarily in the tropics, currently accounts for about 10 percent of annual carbon emissions worldwide — about as much as all cars and trucks on the planet combined. But as Jonah Busch of the Center for Global Development points out, stopping all tropical deforestation would cut greenhouse gas emissions by as much as a third, and at a fraction of the cost of comparable emissions reductions in the United States or Europe. One key approach to protecting forests, REDD+ (Reducing Emissions from Deforestation and forest Degradation), has been in development for a number of years and has already attracted an estimated $10 billion in international investment, overwhelmingly from government sources. The only piece missing from the equation was a strong political signal to reassure both governments and private markets that REDD+ was here to stay. That ambiguity was especially apparent in the lead-up to Paris, as one of the big questions became whether emissions reductions achieved through REDD+ would count toward countries’ national climate action plans, or INDCs. Our research at Forest Trends’ REDDX initiative also found that the private sector only accounted for 10% of all finance we tracked through 2014, suggesting that companies were hesitant to jump in with both feet until these questions were resolved. 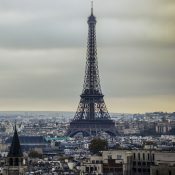 While many observers expected countries to strike a deal in Paris, some environmentalists feared that forests would only appear as a small, implicit part of the resulting agreement. 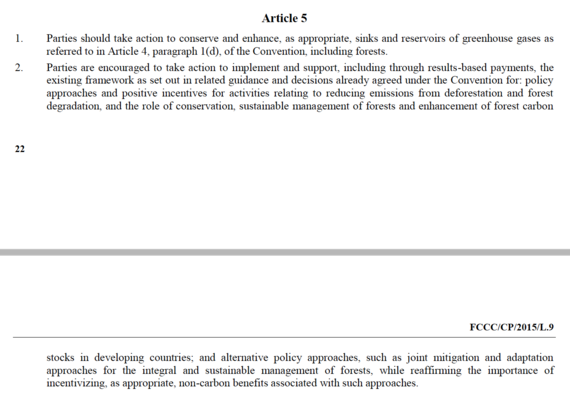 Instead, the Paris Agreement features a very explicit stand-alone article devoted to REDD+. This unexpected development sends a clear message that REDD+ is a prominent piece of the new global climate action strategy. 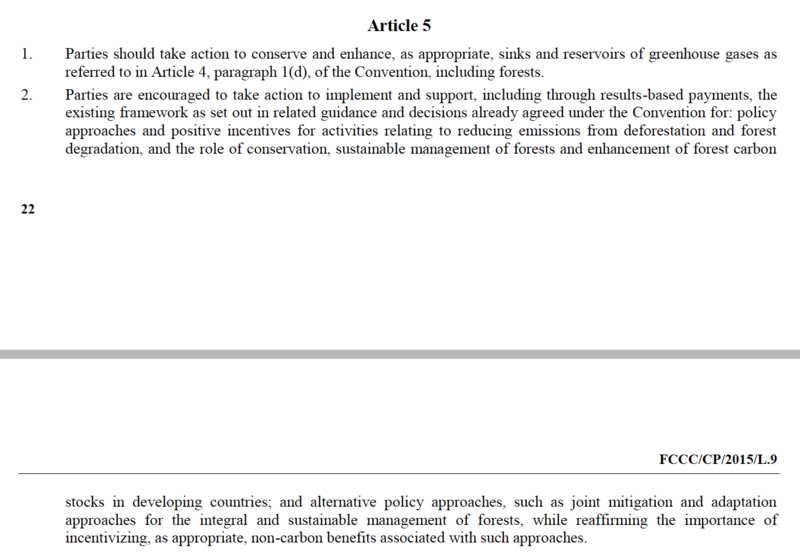 The passage, Article 5, clearly references the 1992 UN Framework Convention on Climate Change – the first time countries of the world came together to acknowledge and agree to address climate change. As a result, this year’s agreement operationalizes the REDD+ package and sets the stage for forests to play a major role in the fight against climate change. Getting agreement for such a prominent mention of forests was truly a global team effort. Forest Trends worked with NGO colleagues, including Conservation International, Environmental Defense Fund, Amazon Environmental Research Institute (IPAM), National Wildlife Federation, Rainforest Alliance, The Nature Conservancy, The Union of Concerned Scientists, Woods Hole Research Center, and World Wildlife Fund. We worked tirelessly and effectively to develop policy ideas, provide research, and inform our joint advocacy based on the best experience and expertise of our members. This informal coalition of NGOs advocates for due recognition of the role of forests in the new climate change regime. And of course, many countries are doing the hard work and rightfully receive the bulk of the credit for taking a simple idea for forest protection and after ten years enshrining it into the Paris Agreement. For Paris to be a success, it was critical that countries work together to reach a strong and equitable Paris Agreement. Now with political backing from the world’s governments, we are hopeful that forests can help achieve deep cuts in global emissions even in the interim period leading up to 2020, when the Paris Agreement takes effect. Most importantly, those emissions reductions should be achieved in a way that respects principles of environmental integrity and delivers meaningful benefits to local communities, in particular Indigenous Peoples. Forest Trends and partners will continue to work on this critical environmental, economic and development issue. This post is part of a series produced by The Huffington Post, in conjunction with the U.N.’s 21st Conference of the Parties (COP21) in Paris (Nov. 30-Dec. 11), aka the climate-change conference. The series will put a spotlight on climate-change issues and the conference itself. To view the entire series, visit here. ← It’s Official! Paris Accord Adopted! ● 1.5 To Stay Alive!